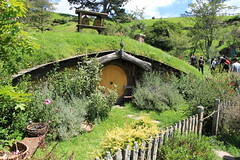 New Zealand became synonymous with the Middle-earth of JRR Tolkien's famous books following the release of the blockbuster Lord of the Rings film trilogy. The movies were filmed entirely in New Zealand by Sir Peter Jackson at numerous locations, and you can travel to many of them by bus with InterCity. Interesting Fact: The term “Middle-earth” was not actually invented by Tolkien. It existed in Old English (5th -12th century) as middanġeard and in Middle English (12th-15th century) as midden-erd or middel-erd. It is English for what the Greeks called the οικουμένη (oikoumenē) or "the abiding place of men", the physical world as opposed to the unseen worlds. Tucked away on picturesque private farmland near Matamata in the North Island's Waikato region is the set of Hobbiton, which draws visitors from around the world for guided tours to see the famous 'Hobbit holes', along with the Mill and The Green Dragon. The set is on a working sheep and beef farm, just a short distance from the township of Matamata, a quintessentially rural Kiwi town, known for its thoroughbred industry and dairy farming. InterCity operates daily buses to Matamata from Auckland, Hamilton, Tauranga and Rotorua, with excursions including a two-hour guided tour of Hobbiton Movie Set. Full day excursions start from just $139 per person - Learn more.. 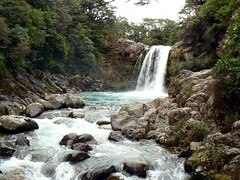 There are several locations around the Mt Ruapehu region that were used during the filming of The Lord of the Rings Trilogy, including Gollum's Pool. InterCity operates multiple daily bus services from across the North Island to the Ruapehu region, including Taupo to the north and National Park to the east. Search for fares and timetables now and book online. The most accessible filming location in Wellington is Mount Victoria, which is within walking distance of the central city. The forested areas of the mountain were used to depict Hobbiton Woods, where the hobbits hid from the black riders. Other Wellington locations include the Hutt River between Moonshine and Totara Park, which played the part of the River Anduin; and Harcourt Park, which was transformed into the Gardens of Isengard. To the north of the city on the west coast to Paraparaumu and Queen Elizabeth Park which was used for filming the Nazgul and mumakil in the Battle of the Pelennor Fields. 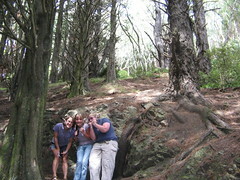 Further up the coast is Waitarere Forest (Osgiliath Wood), where Frodo, Sam and Smeagol walked after leaving Faramir. Wellington is also home to Weta Workshop, Weta Digital and the Miramar film empire, which is central to The Hobbit Trilogy production. While the movie business centre is off-limits to visitors, The Lord of the Rings pilgrims can experience the Weta Cave. InterCity operates daily buses to Wellington from across the North Island. Search for fares and timetables and book online - no credit card required. Nelson is home to Jens Hansen, the goldsmith responsible for creating the 40 different rings used in production. 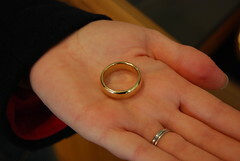 One of the original rings is on display and you can even buy copies of the ring in either 9 and 18ct gold. North of Nelson is Takaka Hill, which was the filming site for Chetwood Forest. It was here that the Ranger 'Strider' led the hobbits into the rough country east of Bree in an attempt to escape the Black Riders. InterCity operates daily buses to Nelson from Picton and Christchurch. Use the fare finder opposite to search for fares and timetables. Near Twizel in the Mackenzie Country, Peter Jackson filmed the epic battle of the Pelennor Fields, where thousands of orcs bred by Sauron clashed with the men of Gondor and Rohan. The grassy fields that stretch to the foothills of the mountains look exactly as described in The Lord of the Rings. 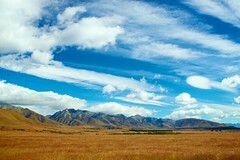 The location is on private land, however you can arrange a tour in the town of Twizel. InterCity operates daily services to Twizel from Queenstown and Christchurch. 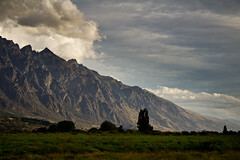 The Remarkables, the spectacular mountain range overlooking Queenstown, was used for scenery in Lord of the Rings and as the Misty Mountains in The Hobbit. From Glenorchy located at the northern end of Lake Wakatipu, you can see the north-western slopes of Mount Earnslaw, which featured in the opening sequence of The Two Towers. In Arrowtown you can walk to the Ford of Bruinen on the Arrow River and also Wilcox Green, where the Gladden Fields scenes were filmed. The Chard Farm winery provides views of the Anduin and Argonath (Pillar of Kings); however, the actual Pillars were computer generated in the studio. Speargrass Flat north of Queenstown and Wanaka comprised the Lonelands. InterCity operates daily buses to Queenstown from Christchurch, Dunedin and Invercargill.